Abbas Zaki is a senior official in Fatah. He is currently a member of the Fatah Central Committee and (since 2009) the Commissioner of Relations with Arab Countries and Relations with China. He was the PLO Ambassador in Lebanon until 2009 [Ma'an, independent Palestinian news agency, Sept. 10, 2009]. He remains a close associate of PA Chairman Mahmoud Abbas and has also been chosen on several occasions to deliver speeches in Chairman Abbas’ name. The image shows Fatah Central Committee member and Fatah Commissioner for Arab and China Relations Abbas Zaki giving a speech. Standing on stage behind Zaki is a row of masked men pointing assault rifles into the air. Fatah Central Committee member Abbas Zaki: "There is a conspiracy, I’m telling you – wherever there is a problem, there is a Zionist fingerprint on it." Headline: "Abbas Zaki to SHMS News: We are proudly following the Givat Assaf operation, and you will soon hear of the absolute cessation of the security coordination"
"Fatah Movement Central Committee member [and Fatah Commissioner for Arab and China Relations] Abbas Zaki today (Thursday) [Dec. 13, 2018] welcomed the Givat Assaf operation in which 4 Israelis were murdered and wounded (i.e., 2 murdered and 2 wounded) by shooting east of Ramallah). Abbas Zaki said: 'We are proudly following the events in the West Bank. The young Palestinians are avenging a blood vengeance – three Martyrs (Shahids) (refers to terrorist murderers Ashraf Na’alwa and Saleh Barghouti who were killed resisting arrest, and possibly terrorist Majdi Mteir who was killed while committing a stabbing attack; see notes below –Ed.) for three Israelis. (not clear who Zaki is referring to as there have been 5 Israeli murder victims in recent attacks –ED.) This is a great thing.'" "Fatah Movement Central Committee member [and Fatah Commissioner for Arab and China Relations] Abbas Zaki today (Thursday) [Dec. 13, 2018] welcomed the Givat Assaf operation in which 4 Israelis were murdered and wounded (i.e., 2 murdered and 2 wounded) by shooting east of Ramallah. Abbas Zaki said: 'We are proudly following the events in the West Bank. The young Palestinians are avenging a blood vengeance – three Martyrs (Shahids) (refers to terrorist murderers Ashraf Na’alwa and Saleh Barghouti who were killed resisting arrest, and possibly terrorist Majdi Mteir who was killed while committing a stabbing attack; see notes below –Ed.) for three Israelis. (Not clear who Zaki is referring to as there have been 5 Israeli murder victims in recent attacks –ED.) This is a great thing.'" Zaki noted that the suffering of the brothers in the Golan as a result of the barbarity and tyranny of the occupation is the same suffering that the members of the Palestinian people are experiencing everywhere they are located in the occupied Palestinian territories. He added that the enemy is one, and that the goal is to take control of the resources of the region's peoples, and to redistribute them. He noted that what is happening in Syria is occurring in the same context, as the West and the Israelis do not want the region to be unified and stable. Zaki expressed his appreciation for the victories that the Syrian army has achieved against the armed gangs in Syria, and emphasized that the Syrian people, under the leadership of [Syrian President] Bashar Assad, will obtain the final victory over the enemies of sister Syria." 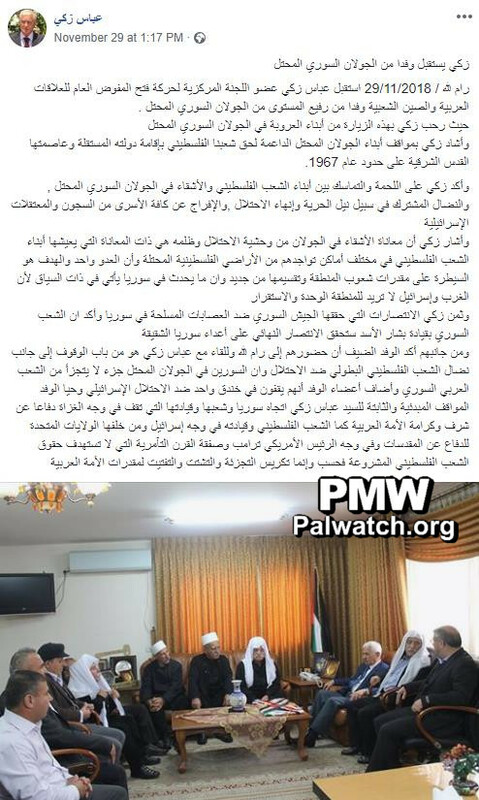 “Fatah Movement Central Committee member [and Fatah Commissioner for Arab and China Relations] Abbas Zaki denied that he gave any statements on the matter of who was put on the terror lists. “Fatah Movement Central Committee member [and Fatah Commissioner for Arab and China Relations] Abbas Zaki said that the American terrorist lists that were published yesterday (Tuesday) [Nov. 13, 2018] are a source of pride to our Palestinian people and a badge of honor on the chest of everyone whose name was included on these lists. In a press statement, Zaki explained that the American decision to put the senior [Hamas] official [and founder of the Izz A-Din Al-Qassam Brigades, Hamas’ military wing] Saleh Al-Arouri on the terror lists reflects the arbitrary American bias [in favor of Israel], and [America’s] practical contribution to the hostile treatment of our people and standing against its aspiration for freedom. Zaki called on the free people of the world to come out against the American actions, which sponsor terror, and not to recognize any list that is published on the basis of its solidarity with the Israeli project in the region. Host: "Even Europe did not accept them."